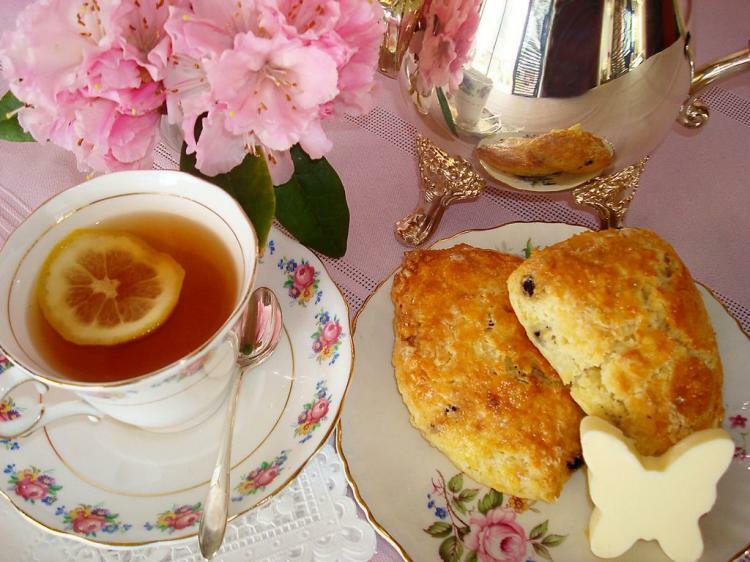 How about a Mother’s Day Tea? Mother’s Day is this Sunday. Are you ready? My mom lives across the country so my preparation in minimal. I have my card in the post, and was given strict instructions not to send a gift. Now that she has discovered Skype, what she desires most on Mother’s Day is to see my face. For those of you blessed to have Mother living within driving distance, it can be a struggle to decide how to celebrate the day with her. Since it is Tea Tuesday, might I suggest that you try a tea party. Your heritage might be somehow linked to the British Empire, but I think I am safe in saying that Moms generally appreciate any meal they don’t have to cook, particularly if sweets are involved. If you have siblings with little girls, you can gather the whole troop together, and let the kids experience a fun version of tea. 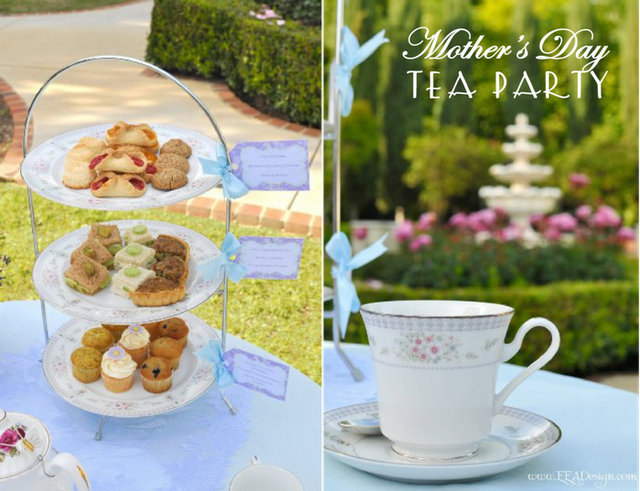 You don’t have to invest a great deal of money or effort in putting together a memorable tea for Mom. Sadly, if you have not already made a reservation at a tea house, you aren’t likely to get one. But they can be busy, rushed and not at all relaxing. I think the secret to Mother’s Day is to remember that moms generally just want to spend some time with you and the family. Tea for Mum can be as simple as cream tea which is simply scones, served with clotted cream and tea. A nice table cloth, mismatched tea cups, plates and a nice pot of tea. My Basic Scone recipe will have fresh scones on the table in 30 minutes, and the recipe can be adapted in a number of ways. Middle level should hold the sweets and fruits. 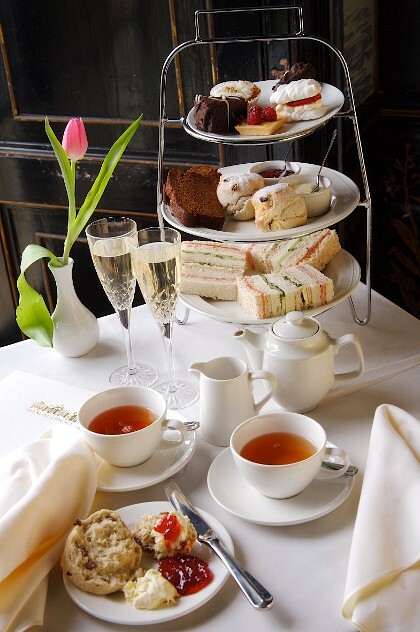 The order in which you eat from the tray is the order in which you normally eat your meal: savouries first, scones next and sweets last…UNLESS there are hot scones, and then the order changes to scones, savouries, then sweets. You can likely manage the sandwiches easily enough, and if pressed can fill in the sweets level of the tea tray with your mom’s favorite sweets from your local bakery. The key is to ensure bite sized pieces. 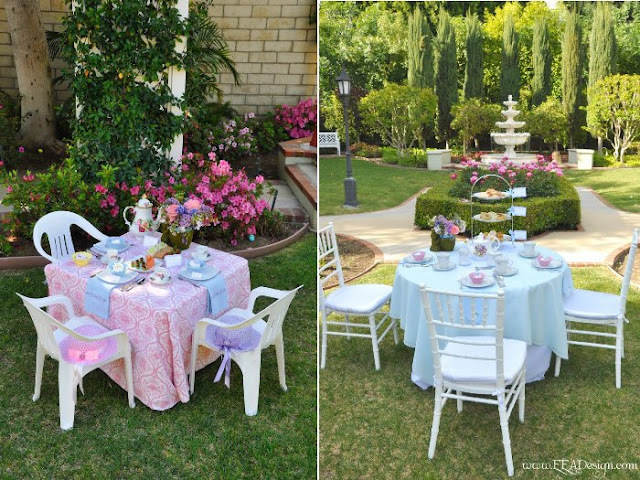 The opening photo for today’s post comes from Bird’s Party who shared Enchanted Events and Design’s great ideas for a Mother’s Day Mother and daughter tea party. This will allow you to include three generations into the mix and perhaps your daughters will treat you to the same when they grow up. I seem to have accumulated a hodge podge of tea cups, little plates and tea pots over the years, but if you have been inspired by the idea of tea for Mom, but don’t have the necessary cups or plates, don’t despair, help could be as close as your local Goodwill or other charity store. Great bargains and you are helping a great cause. Don’t get too stressed about making tea, particularly since tea is now conveniently sold in tea bags. To distinguish yourself as a tea aficionado, just follow the time-honoured tradition of first warming the tea pot. Add a bit of boiling water to the pot, give it a swirl and pour it out before adding your tea. Then add the boiling water, and steep tea for 3 or 4 minutes and don’t let the tea steep too long or it will become bitter. If you go with loose tea, the general guideline is to allow for 1 tsp per person, 1 tsp for the pot, and allow 10 ounces per person. Use a tea strainer and pour into cups. You may wish to fill your tea pot with tap water, pour into a measuring cup to determine how many cups your pot will hold. My discovered scone recipe is quick and easy to make with a number of variations you can do from just one recipe. I have doubled the basic ingredients and made two different versions. 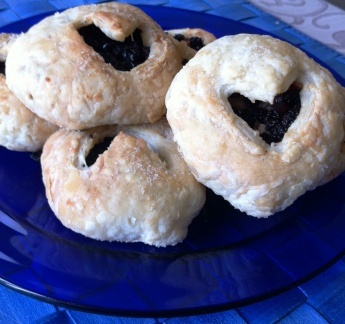 There are other recipes which are quick and easy to make, including today’s recipe, Eccles Cakes. Not really a cake, but a puff pastry pocket filled with currants and mixed peel. If you are a stickler for tradition, this is a great recipe to add to your tea tray. Lord D loves them but hasn’t had them in years…until I came along. The name comes from Eccles, the town near Manchester where the cake was originally sold on a commercial basis. In 1793 James Birch’s shop on the corner of Vicarage Road in Eccles began selling small, flat, raisin-filled cakes. Rumour has it that he was inspired by the sweet patties recipe in The Experienced English Housekeeper. More recently the question of origin of Eccles Cakes has been raised in Parliament. A question was tabled regarding the future of cakes made outside Eccles to the same ingredients. Could non Eccles-made cakes still be referred to (and sold) as Eccles cakes? Stay tuned. In a medium saucepan, combine the sugar and butter (or applesauce) and cook over a medium heat until melted or mixed together. Place 1-2 teaspoons of filling in the center of each circle. Turn over the cake over so the seam is now on the bottom and then press gently with a rolling pin to flatten the cakes. Snip a V in the top with scissors, or you can make 3 slits with a knife. I like the V since it looks like a little heart when you are done. I was interested in your basic scone recipe. Everytime I click on it, I get sent back to your main page instead of the recipe. sorry about that, try again. They are yummy! Yum! I can’t wait to try these! BTW, we are back on wordpress (bellegrove) and are excited to use a lot of your recipes to serve our guests! Thank you!